For a while I've been working on new items to sell on my Etsy shop, and finally everything is ready, it does not seem to take a lot of time to get your shop up and running, but it really does. Between making the items, taking the pictures and all the photo editing I always ended up putting the store on the bottom of my to do list. There are still more items to come, which are my favorites, that I will hopefully post in the next few weeks. First of the items is the knotted leather necklace, that you probably already know, this is made with real leather cords, which make it more durable and the color will not peel off. There is also a bracelet version of the necklace, with a leaver-back closure to make it easier to open a close the bracelet. Again, another leather bracelet, made with real leather and metallic beads. It is adjustable in the back with a small piece of chain. This headband is actually a return, I had this for sale when I first started the blog. 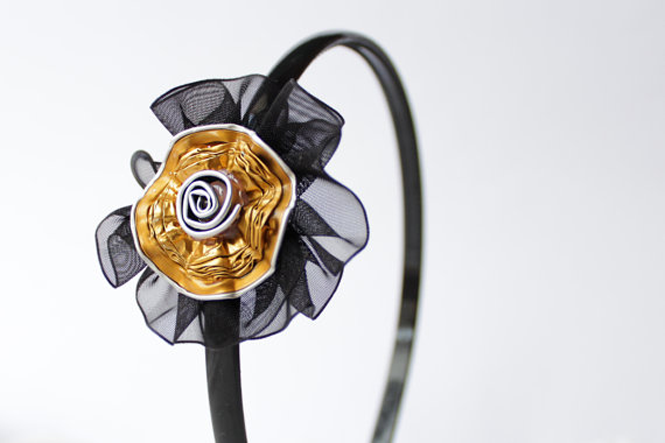 It is made with up-cycled coffee capsules, and chiffon ribbon. A great way to be stylish and help the environment. If you are interested in knowing more about the items you can click bellow to see it on Etsy. Do you have any suggestions to improve my store? What is your favorite item? Your new shop items look lovely! And you are right about how much time goes into selling items on Etsy (or any online venue). Taking pictures, photo editing, and promoting can take almost as much time as creating the actual product. Making the items is the easy part because it's what most of us who sell handmade items are passionate about. Happy sales!